The mango season is here again as evidenced by dominance of mango fruit in wholesale markets, fruit vendors’ stands, grocery stores, fruit salad menus etc. Just a month or two ago before the season started, one fruit (weighing 300-500 g) retailed for 50 – 80 KES in supermarkets and 30 – 50 KES in the open market stalls. 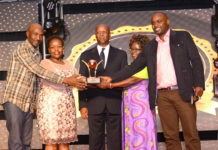 Farmers who had an off-season crop cashed in greatly because the on-farm price ranged from KES 15 – 30 per piece. This is 5 to 10 times the farm gate price (KES 3 – 5) during the peak season. Mango season starts from December and peaks in January/February in most of the mango growing Counties in Kenya. Owing to wide adaptation to diverse agro-ecological conditions, mangoes are produced in many Counties, from the Coast to the Highlands. According to the Horticultural Crops Directorate (HCD), the top 10 mango producing Counties by value include Makueni (30%), Machakos (23%), Kilifi (16%), Kwale (8%), Meru (4.5%), Embu (2.8%), Bungoma (2.1%), Tana River (1.8%), Elgeyo Marakwet (1.1%) and Murang’a (1.1%). Most of the mango fruits produced in Kenya are for the domestic market and mainly the fresh market. A very small percentage (less than 5%) of mangoes produced in Kenya are processed or exported. Therefore during the peak season there is an oversupply of mangoes in the domestic market. This oversupply contributes to high postharvest losses (PHL) reported in the mango value chain. Some studies give a conservative estimate of PHL in mango as 40-50%. However this figure varies significantly depending on factors such region, year, scale of production etc. The loss figures provided by mango farmers vary significantly from as low as 10 % to as high as 100%. During the last season, some farmers indicated that they lost 100% of their crop because the traders who had promised to buy their fruits did not honor the promise. These farmers had avoided to sale to other brokers in anticipation of a better deal from the trader but ended up with almost 100% losses. Mango is a very highly perishable fruit and once it matures on the tree it must be harvested, otherwise the fruits will fall off the tree and rot. High perishability of mango; lack of appropriate cold storage facilities to delay ripening/deterioration after harvest; lack of processing facilities to transform the perishable fruits into shelf-stable products predisposes mango farmers to exploitation by traders. The traders know that without cold storage or capacity to process, the farmers are helpless and can accept any price given or else the fruits will rot leading to total (100%) loss. What options are there for mango farmers during the peak season? There have been efforts to promote low-cost cool and cold storage technologies which can be used by farmers (preferably in groups) to aggregate their fruits with the goal of achieving the quantities and consistency required by traders. Examples of these technologies include Coolbot™ (a low-cost alternative to conventional cold rooms) and the evaporative cooling technologies (including the evaporative charcoal cooler and zero energy brick cooler). 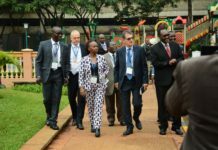 The University of Nairobi postharvest project team which is supported by the Rockefeller Foundation under the YieldWise Initiative has used these technologies to demonstrate the concept of smallholder aggregation and how it should work. 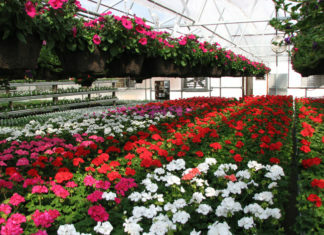 The concept has been demonstrated in two smallholder aggregation centers in Kenya namely Karurumo Smallholder Horticulture Aggregation and Processing Center in Embu County and Masii Horticulture Cooperative in Machakos County. In Karurumo the installed storage facilities include ZEBC (2 tons capacity), ECC (4 tons) and Coolbot cold room (4 tons). At any one time the center can aggregate up to 10 tons of mango fruit, which is a reasonable volume for any trader targeting the local or export markets. In Masii the three ZEBCs and one ECC installed can be used to temporarily store up to 8 tons for mango fruits. Effective and profitable marketing the aggregated fruits requires market information and good linkages between the farmer groups and traders. It is expected that with such organization, farmers can negotiate for better prices from the traders. Even with aggregation facilities, farmers have reported that the price per piece of mango at the aggregation centers ranges from KES 5 – 10. Although this is slightly better than the average market price (KES 3-5 KES) during the peak season, it falls far below what farmers should be paid to make reasonable profits from their mango production businesses. Although selling mango fruit in their fresh state is the most common and easiest option for farmers to make money (however little) from mango fruit, there is more value from processing the fruit into diverse products. 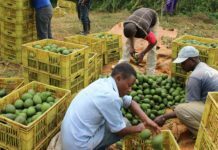 According to an analysis presented at a Postharvest workshop by Ms. Betty Kibaara (Associate Director at the Rockefeller Foundation), the profits from sales of fresh mangoes is estimated to be 284 USD (KES 28,400) per metric ton (MT). However this profit is not assured in instances where farmers lack market for fresh fruits and incur high postharvest losses. Processing of mango fruit into various products offers an alternative cash stream for the farmers while reducing the high postharvest losses. The most common and obvious processed product from mango is juice. Therefore efforts to help smallholder mango farmers to reduce postharvest losses and increase profits have focused more on equipping them with juice processing facilities. In this regard, there many farmer groups in mango producing regions which have been facilitated with pulping machines. The machines are used to make mango pulp from which other products such as mango concentrate and ready-to-drink mango juice can be made. 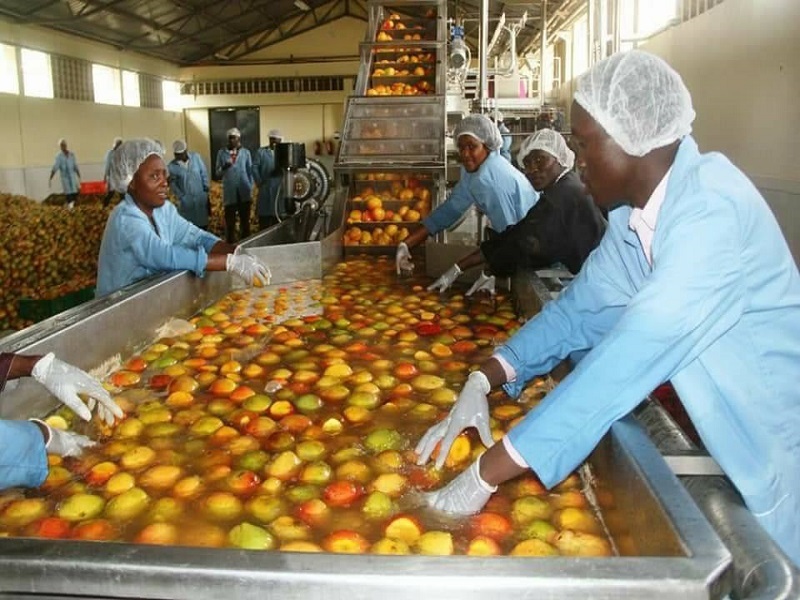 Processing mango pulp from the surplus mango fruit during the peak season (December to February) provides a better an alternative to leaving the fruits rot away on the farm and the consequent high postharvest losses. This is the approach that has been adopted by various development partners and County governments in mango producing areas. A good example of this intervention is in Makueni County where the Governor (Prof Kivutha Kibwana) has established a juice processing plant for mango fruit. Juice processing is a good intervention but it is not highly profitable for farmers. According to Ms Kibaara, the estimated profits for juice processors is 117 USD (KES 11,700) per MT which is far below the profits from sales of fresh fruits (KES 28,400 per MT). Although juice is the most commonly consumed mango product, there are many other products that can be derived from mango fruit. These include jam, chutney, jelly, flour, wine and a variety of dried products. According to the projections from Ms Kibaara’s analysis, dried mango products provide the highest profit margins estimated to be 4,400 USD (KES 440,000) per MT. It should be noted that approximately one MT of fresh mangoes can yield up to 100 Kg of dried mango chips (10:1 conversion ratio). From Ms. Kibaara’s analysis, the profits from dried mango fruit is almost four times compared to the profits from mango juice. Dried mango products are not new in the Kenyan market. There are several private companies and entrepreneurs who are engaged in the business of drying and/or marketing the products. Some of the private companies contract smallholder farmers to dry the fruits which they buy, package and sell under their company’s brand name. Dried mango products such as mango chips and mango leather (rolls) are available is selected market outlets. Unfortunately many Kenyan consumers are yet to appreciate the value of dried fruits (and vegetables). This could be attributed to lack of awareness about the available dried products and their nutritive value. It is also important to disabuse the misconception that dried fruits (and vegetables) are not as nutritive as the fresh ones. Proper processing practices must be observed during preparation, drying and packaging of the products so as to ensure high quality and safety standards. It is also important to provide correct nutritional information on the package to assure the consumers of the quality and nutritive value. Proper packaging of the dried mango products is important to ensure preservation of the quality during the marketing period. There is need for concerted efforts to promote dried/dehydrated mango fruit products such as mango chips and mango leather (mango roll) as healthy alternatives to junk foods such as potato chips and crisps. An increase in the demand for dried/dehydrated mango products will have a ripple effect to the benefit of mango farmers who have over the years not reaped from their labor. The challenge is for County governments (and development partners) in mango producing regions to endeavor to exploit the potential of mango fruit beyond pulping and juice making. Although this offers an alternative to reduce postharvest losses in the mango value chain, it is the least profitable use of the fruit. Value addition of mango fruits into diverse products and finding reliable markets for the products will ensure better profits for farmers and ultimately improve their livelihoods and food security situation. In addition, small scale processing can spur growth of cottage industries in rural areas, thereby contributing to industrialization as envisioned under the ‘Big Four’ agenda.